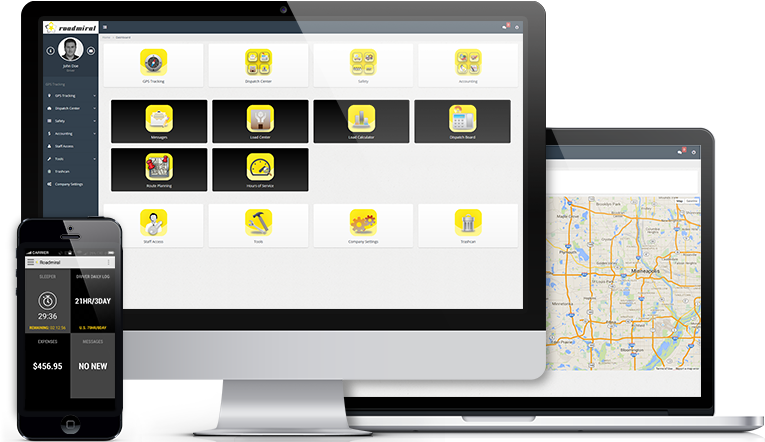 Unique GPS-based application that provides business with the tools to maximize and manage mobile workforces and assets. Whether you need current truck position, speed, current status or history view. 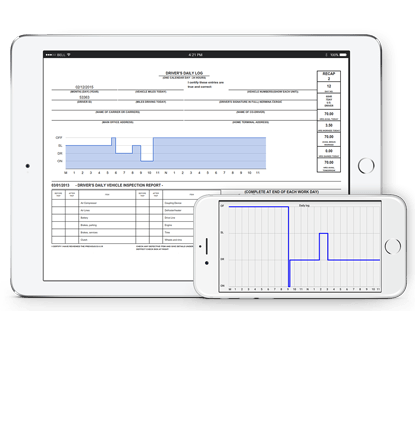 E-Log Book + DVIR Eliminate the cost of paper inspections, stay compliant with inspection regulations and save up to 20 minutes per day per driver. Electronic form that does all of your IFTA tax calculations for you. 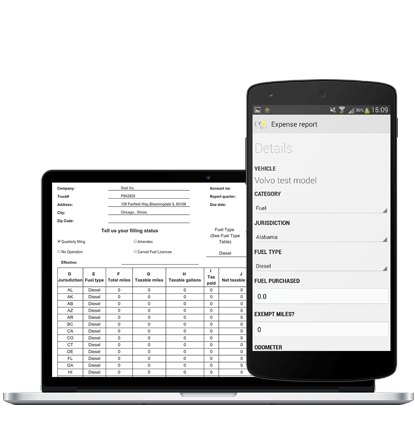 Roadmiral IFTA Reporting Software solution lets you audit driver miles to get a precise overview of your fleet activity and current tax liability, putting you back in control of your fuel taxes. Roadmiral software have not only been cost-effective, but their service has been exceptional, for instance, their E-Log Book saved us a lot of time and we stayed compliant with inspection . Their extremely cooperative staff processes our requirements efficiently and always has suggestions to assist in selection. Their entire organization is supportive and actively engaged to deliver the specific results I need to manage our 50+ trucking fleet. We can now focus on our business objectives and leave the business of fleet management to the experts. Extraordinary customer service and flexibility make Roadmiral the most cost-effective means of fleet management. Roadmiral’s monthly costs were by far most competitive for the offered services. Our overall costs dropped in one year by 20%. Their E-Log Book and IFTA features saved as a lot of time and reduced insurance costs since we had 0 OOS violations. Cost effective IFTA solution saved us $5000 per quater since we don’t need to outsource this service to other company. The Roadmiral 2 Way messaging system provides seamless communication between many users in real time with unlimited history feature allowing you to go back in past and see the messages that have been sent and received. Our Roadmiral Messaging System provides your company a central location for all your broadcast messaging needs. With the ability to create messages based on your employees’ data and not just their email addresses, you are able to automatically communicate messages when employee information changes. Your central point for most important part of each company. Load Center provides central information point for every Load that has ever been transported by the company and show full details of each transport. 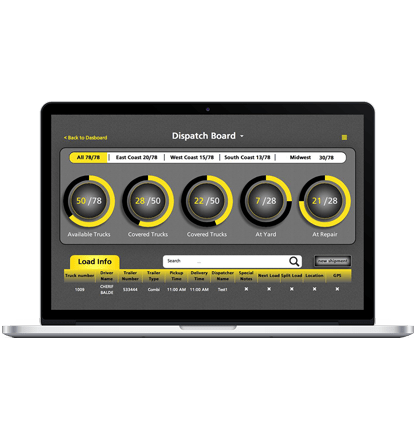 Being connected directly to Dispatch Board allows you to simply enter the information of all current Loads and they will automatically display on Dispatch Board – this way there is no need to overwrite the data and everything is synchronized ensuring that time and money are not wasted. The new Roadmiral Load Calculator is a professional tool developed to increase productivity of your fleet. Designed to give information in a fraction of a second Roadmiral Load Calculator provides detail insight into any Load profit information. If you ever doubt if some Load is profitable or not, Load Calculator will provide that info in a moment. More over it will do that for 6 different loads at the same time. Load Calculator is designed to be smart and user-friendly and it will provide Drivers and Dispatch professionals with higher productivity and efficiency. It also allows carriers to input variables specific to their company and It returns a customized dollar per mile rate immediately. Roadmiral Dispatch Board is simply the most advanced Dispatching system of the 21st Century. It is a central point for every day operations in every company. Dispatch center improves operations, productivity and the fast, effective decisions that can reduce decision making times by more than 30% and lower wrong decisions by 42%. Our top design and functionality brings you savings in time when it is most valuable. From this one screen, you can quickly dispatch all your personnel and resources on a specific day and track the work loads and assignments of your resources at any given time. 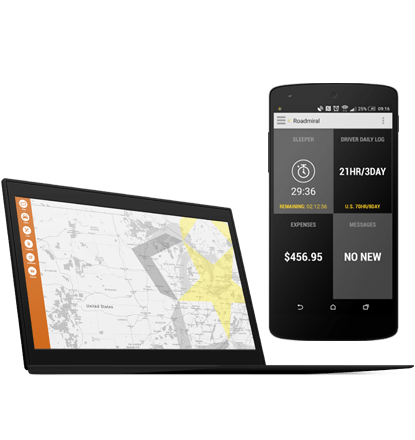 The Roadmiral Route Planner is an intuitive web-based Routing Optimization Software for Fleet Management,Field Service Management,Mobile Workforce Management and Pickup/ Collection and Delivery companies. Roadmiral organizes all of your travel plans in one spot, and builds local maps and driving directions, equipped with turn by turn route detail, based on your trip destination and real time traffic conditions. Share accurate Expected Times of Arrival. Meet Customer Expectations, including Time Windows, Service Time and special Skill Requirements in your Planning. Changing rules and regulations make keeping up to speed with compliance a full time job – and a constant challenge. Roadmiral management solutions meet that challenge by delivering electronic logs. You can eliminate the cost of paper inspections, stay compliant with inspection regulations and save up to 20 minutes per day per driver. Primarily, knowing all the information is a key to success. Offering all information about your drivers at one place, makes sure each company to have all necessary data, just a click away. By providing the data like medical tests expiration dates or driver license information, you are constantly up to date with the status of each company’s driver, therefore reacting in each situation in advance. Roadmiral Vehicles allows you to check the status of the Trucks and assigned trailers. The general status of each vehicle is another important issue and you could monitor this as well, with just one click. You will also get the information who is driving the vehicle, together with licensing information and maintenance status. This is what we call a trailer HQ. All trailers at one place, with information of each company’s trailer and the condition of the trailer. This goes together with additional information like the date of last inspection, so you could easily find out the status of each company’s trailer or to see which truck is using which trailer. Roadmiral unrivalled reputation is based on a common sense approach in dealing with claims. This is specific area of the business that asks for a strong control given that it is crucial to know which vehicles are available and suitable for assigning to individual clients, at any time. Our experience with current claims situations or problems leaded us to create the best market Claims solution. You will find out that Roadmiral Claims feature is completely flexible in providing what each individual situation requires. Trucking fleet maintenance software virtually replaces a full-time maintenance manager. This Roadmiral Feature keeps track of each truck or trailer, whether the company has 5 or 105 big rigs, crossing the United States, Canada, Mexico and South America. The easy-to-use system updates each truck log every time any information is put into the system. This careful recordkeeping help you know when maintenance is required for each particular truck or trailer. With Roadmiral DVIR, you can proactively manage inspections and eliminate the mistakes typically associated with paper-based tracking. With full features you can be up to date with your vehicle or trailer condition and ensure that the safety level is at the maximum. Inspection Reports is a series of FMCSA-issued regulations that administer the driver hours of anyone operating a commercial motor vehicle for interstate commerce. An Roadmiral Inspection Reports software solution fulfills this government regulation by fully automating the entry, recording, completion and storage of all required information needed for inspections. Finally an electronic form that does all of your IFTA tax calculations for you! Truckers, trucking companies, tax preparers, and accountants all agree that the Roadmiral IFTA form is the best solution on market! Roadmiral IFTA Reporting Software is developed to save you time and money. Used by truck owners, transport companies or accountants feature will generate the quarterly report required by International Fuel Tax Agreement. The application Roadmiral IFTA Reporting Software solution lets you audit driver miles to get a precise overview of your fleet activity and current tax liability, putting you back in control of your fuel taxes! A happy, satisfied customer is likely to return and/or tell others about the good experiences that they had when dealing with your company – word of mouth, recommendations from friends and colleagues are very valuable. Improved delivery time, accuracy, improved safety are the best way to make your customer happy. This feature is all about that – making clients happy. Roadmiral POD systems allows you to view and download Proof of Delivery (PoD) signature images with the actual signature for the delivery of your shipment, giving you even more control of your shipments. You can deal quickly and efficiently with enquiries from your customers regarding the delivery of a shipment and you can view the POD images online, download them, save, print and send (email or fax) them as required. Don’t waste time handling your E-Log Books and IFTA reports – Roadmiral does that automatically for you. Don’t carry paper work – access you reports online from any place. Track you entire fleet from one central location. Communicate with them and receive paperwork electronically. Automatically create IFTA, stay complaint with E-Logs and do automatic Invoicing. Customized and tailored solutions, reporting and integration with existing IT systems to upgrade and speed up the company performance. Automatization and optimization of existing processes with focus on expense decrease.